Longevity and professionalism are certainly the two most fitting words to describe Oakford Thoroughbred Farm, a picturesque and peaceful boutique farm of 800 acres situated in a fertile valley six kilometres from the historic town of Maldon. A family owned and operated thoroughbred farm, rapidly closing in on its 20th anniversary, it offers the experience and reputation afforded from a lifetime involvement in the thoroughbred industry. Prior to establishing Oakford Farm, Patriarch Brian McKnight had 34 years as manager of leading Victorian stud Trevenson Park. Oakford Thoroughbred Farm is beautifully positioned in a district well renowned for raising stock with strong bone. It is also totally drought resistant while at the same time being shielded from the harsh bitterness of winter. Lucerne lush paddocks are also a bi-product of considered farm management, as is the easy access to a constant water supply. With the breeding season just around the corner, Oakford Thoroughbred Farm headlines as a specialist in professional breeding services. It is central to all major Victorian studs and looms as the perfect place to board your mare/s for the breeding season. The farm also caters for walking out mares, foaling down or sales preparation. This all adds up to a satisfying, worry-free result for broodmare owners. Other than 24/7 access to premium feed and fresh water, Oakford Farm also tailors the agistment experience to include stabling, rugging, premium veterinary and farrier care and even additional horse walking where required. Ashley McKnight is a qualified Master Farrier registered with Racing Victoria and attends to all horse care including corrective shoeing. Meanwhile, on-call veterinary services from Victorian Equine Group Bendigo Veterinarian Dr Sarah Jalim and partners are easily accessible. In terms of the Spelling experience, the McKnight formula is calculated and simple: Time away from the track = decreased earning potential. This equation is solved by aiming to always expedite and enhance the spelling process. Spacious grass paddocks, running water, tailored diets and checking of all spelling horses 3 times daily are all natural occurrences at Oakford Farm. The rehabilitative mantra of the farm is further underlined by offering a full suite of options to enhance recovery. The facilities include a swimming pool, walking machine and water walker. The water walker is not just a training aid. 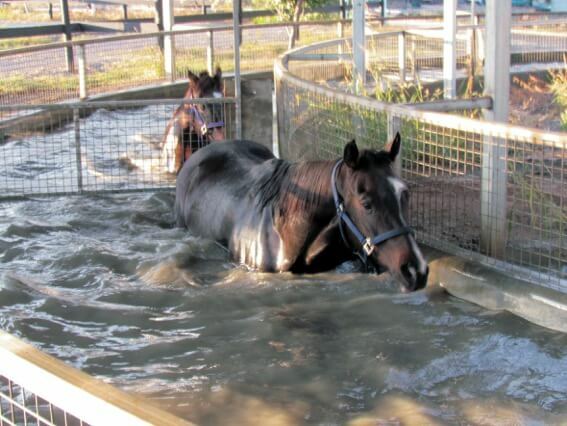 It is an integral tool in the rehabilitation of horses returning from injury. Pre-training is also available, with access to a premium built soft sand track. Experienced riders are also on hand to guide the progress of each horse and offer professional feedback. Farm Manager Brendan McKnight carefully monitors all aspect of the feeding programme, which includes consultation with a Nutritionist. Feed is weighed and mixed daily with a Keenan Feed Processor and the horses thrive on the feed offered. An extension of the Oakford Thoroughbred Farm business is also the diligent preparation of horses for Malaysian and Singaporean clients, with glowing reports coming back that their horses are educated well and perform successful on the racetrack. A recent example of an Oakford Thoroughbred Farm success story from the sale ring is that of Rising Empire (Dehere-Chanon Rose), winner of the Gr3 Magic Millions 2YO Championships. A modest Judy McKnight summed up the Oakford Thoroughbred Farm ethos, "I guess we just try to service our clients to the best of our ability and experience, and receive great feedback. That is the most important thing."